As I mention on my BBQ Ribs page, there are hundreds of BBQ ribs recipe types you can find or create. This is just one dry rub barbecue ribs recipe that I love. It is tangy and a bit spicy and just mouth-wateringly delicious! I have intentionally left out the specific amounts for each of the ingredients because this is a versatile recipe. Frankly, you can prepare it with pretty much any proportions of the listed ingredients, even add a few of your preference if you like, and it will turn out well! It will be a bit different every time but great nonetheless! If you prefer spicier ribs, go heavy on the paprika, chili powder and cayenne pepper in this BBQ ribs recipe. If you prefer them more sweet, increase the sugar and/or honey and back off on the spices. I personally like my dry rub ribs tangy and spicy, so I baste generously with a mixture of vinegars, lime juice, cayenne pepper, sugar and honey. But play around with it, I'm sure you'll find that just about any combination is great for different reasons. Whole rack of pork ribs - you can use other types of ribs as well. I personally like pork ribs for this BBQ ribs recipe but beef ribs, spareribs and others can certainly be used. Submerge the ribs in salted water in a stovetop-proof dish or casserole. Some people prefer to boil the ribs in beer or add a bottle of beer to the water. Other options include adding bourbon, whisky, scotch or tequila to the boiling liquid to instill those flavors. Boil for about 1 hour until the rib meat is softening. Drain and let cool. 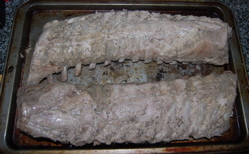 The picture below is of the ribs after they have been boiled. Mix the onion powder, garlic, sugar, paprika, pepper, chili powder and salt. Bind with juice from about half a lime and some apple cider vinegar to make a paste. Rub the ribs with the mixture and let sit to marinate. I like to do this early so they can sit for several hours but should be for at least 1 hour in my opinion. Prepare a basting mixture. I like to use a mixture of lime juice, apple cider and red wine vinegar, salt, pepper, a dash of cayenne pepper, brown sugar and honey. You can add a bit of the other spices as well and adjust this BBQ ribs recipe to your taste, more sugar and honey for sweeter ribs, more salt, vinegar and lime for tangier ribs. Prepare a grill with hot coals and barbecue the grilled ribs, basting with the basting mixture often. Turn when bottom is developing a caramelized and browned color. Continue basting generously and turning as needed until the surface has a nice browned glaze and the meat is tender and falling off the bone. Depending on how hot your grill is, this should take about 20 to 30 minutes total. Remove from heat and let rest, covered, for several minutes before slicing and serving. For this BBQ ribs recipe you simply follow the directions for indirect heat grilling to slowly cook your ribs over lower heat. Use the same instructions as above for the rub and the basting mixture. Be sure to baste frequently after the first 20 to 30 minutes of cooking to keep the ribs nice and moist and to infuse lots of flavor. Without pre-boiling, a rack of pork ribs will generally take at least an hour to become nice and tender and falling off the bone. Take your time and be sure to keep the ribs off direct heat above the charcoal or burners to avoid burning. Serve this BBQ ribs recipe with any favorite side dishes. Some people prefer to serve with a wet side dipping BBQ sauce but I like them as is, letting their spicy and tangy dry rub speak for itself. 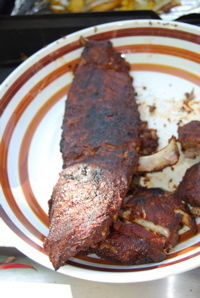 For more information on cooking BBQ ribs, be sure to see my BBQ Ribs page. Done with BBQ Ribs Recipe? Return to the Barbeque Grill Recipe page.